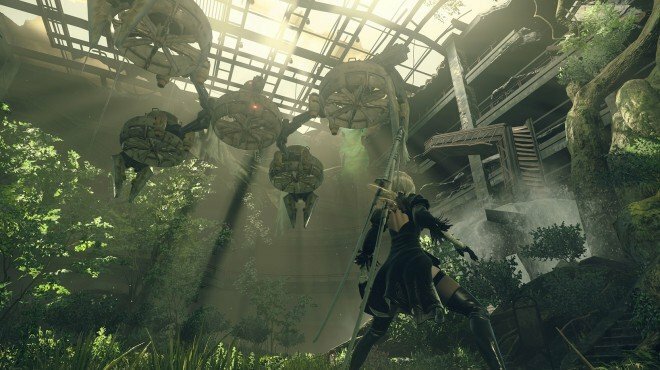 Breaking Through is a Main Story Quest in NieR: Automata. "9S has been tasked with assisting the incomin YoRHa unit in stopping a Goliath-class machine lifeform." After deactivating the defenses, head to the surface to assist the remaining YoRHa unit. This will introduce 9S to 2B. Part ways and perform another flight segment, until you emerge to assist with the boss fight against the Goliath: Engels. Use your ranged attacks to keep the enemy projectiles at bay and press and hold triangle to hack into the needed sections. Once the fight is finished, you reawaken in The Bunker for the quest Reboot.